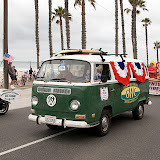 Golden West College and the Boys & Girls Clubs of Huntington Valley were partners again in the Huntington Beach 4th of July Parade. Riding in a horse drawn wagon from Golden West College were: Susan Wall, Classified Employee of the Year; David Salai, Associated Students President; Morgan Mymon, Homecoming Queen; Sumair Duvani, Homecoming King; and Greg Wight, Design Instructor & Faculty Member of the Year. They were joined by outstanding club members from The Boys and Girls Clubs of Huntington Valley, who help staff make a difference to kids at the Club through their commitment to volunteerism and willingness to help. Following the wagon were Wes Bryan, President of Golden West College and Shirley Dettloff, Board President, Boys and Girls Clubs of Huntington Valley in the college’s 1971 outreach vehicle the ‘G-DUB’. Behind the G-DUB, was E/Motion, a battery, solar, and pedal powered vehicle built by students in the GWC Design Program. Driving E/Motion was Steven Sewell, a Design student and past Associated Students President who is transferring to CA State Fullerton in the fall. The Boys and Girls Club of Huntington Valley and Golden West College are celebrating their partnership as the first to build a Boys & Girls Club on a college campus! The first phase of this exciting new facility will be completed by the end of this year.